So I’ve got this idea. It came to me this Summer after reading Felicia Semple’s August 1st post titled ‘Enough Is As Good As A Feast’ on her blog The Craft Sessions. When you get a chance, go give it a read. Since I shut the studios in Portland down, I’ve been wondering exactly what AGOS is when I’m not leading retreats. You’ve probably heard this refrain from me before. I gnaw things over like the proverbial bone and his dog. 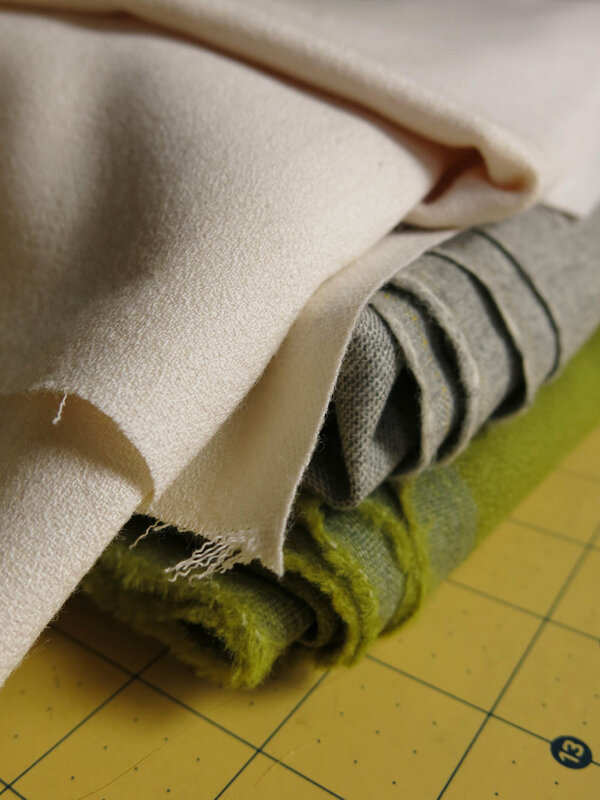 Being exposed to so many ideas around sewing clothing, and sewing quilts, and knitting, and natural dyeing, and all the other myriad ideas of making with fiber and textiles that are swirling around the collective conversation, has brought up some specific issues for me. Consumption keeps coming up. In my bid to slow things down and savor the sweetness (and struggle) of a thoughtful life, I have been struck by our gnawing need to accumulate, to acquire. Modern studies have proven that experiences stick with us more than things. However the acquiring of things, the buying of stuff, the accumulation of possessions, is something we all seem to default to. I imagine it is some instinctual holdover from less abundant or predictable times in history. Make sure you have enough for the inevitable lean times by stocking up. In modern times it takes different forms. Having an event? Need a marketplace. Traveling? Must buy a souvenir. Seen a new fabric/pattern/yarn? Have to own it. I am not pointing the finger at anyone. I am quite susceptible to these urges, and while becoming more selective in my purchases, still end up with things I’m not sure what to do with. I brought fabric and yarn back from Portugal. I have had a bad habit in the past of buying things just because they were on sale. Some of that impulse was instilled in me by a Mother who grew up during WWII. This means I have some cuts of lovely fabric that are not in colors I adore, or even think I would wear. Then there are cuts I bought with an intention that never materialized. Or for patterns that I fell out of love with before I ever made them. Or cuts that looked very different in person then they did on the monitor. I have many pieces bought at stores that I have visited in my travels, where I felt a kinship with the proprietor and wanted to show my solidarity by doing business with them. Sometimes I bought fabric because I was afraid (?!) I would never see it again. The fabric industry wants you to think that, they encourage that neurosis by releasing new lines of fabric and discontinuing older ones. This phenomenon is worse in the quilting world. Luckily when it comes to garment sewing, weaves of linen, wool, silk, and cotton will always be around in colors you want to wear. Perhaps not that remnant from the big name fashion designer, but there will always be offcuts in that market too. This recognition has allowed me to calm my purchasing down a bit. The urge can be somewhat contained. The more self-knowledge I gain, the more I can head these impulses off at the pass. I am proposing a fabric swap. 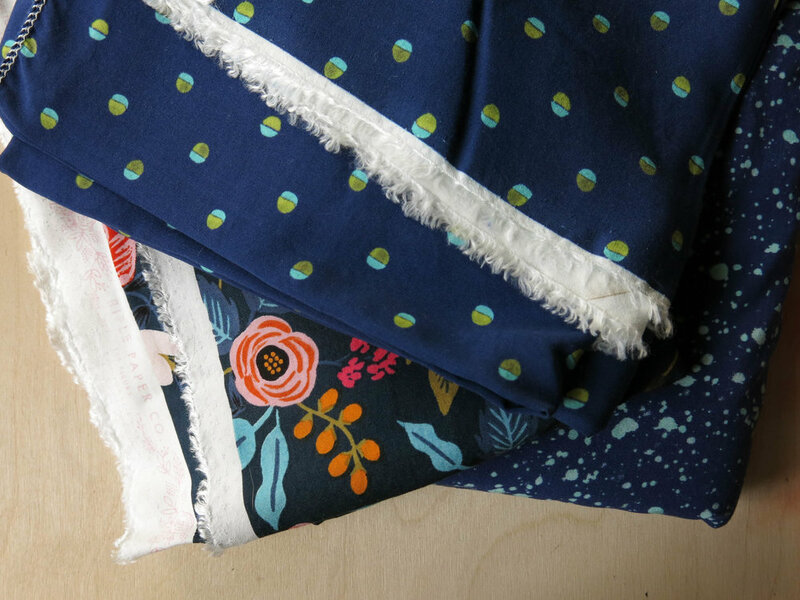 The Slow Fashion Fabric Swap. (#slowfashionfabricswap) I will organize it, and collect the names and addresses of anyone who wants to participate. In an effort to raise awareness about our individual consumption let’s each take a piece of fabric from our stash that for some reason, any reason you choose, isn’t serving you, and pass it along to another sewist. For a tiny brief moment we will slow the behemoth of commerce a tick, by willfully exchanging fabric instead of purchasing it. We will as a community make a small gesture to recognize our consumption. We will be mindful of our participation in the commerce of making. We will release the hold on our psyches of one small bit of our stash. We will acknowledge the desire for new and satisfy it with something new to us, but re-purposed from the universe. We will be mindful, considered, thoughtful about our making and it's accompanying consumption. Now, during a season of Slow Fashion. I mean, think of it, when you take a peak in the stash of a friend, doesn’t everything in there look new and exciting, different and intriguing? If we collectively move some fabric around into other stashes, we are getting something new without pulling out the credit card. Without supporting a corporation that neglects it’s workers and pollutes the environment. Without contributing to a bloated system that appeals to our baser instincts and neglects our intellect. And we can do all of that while still scratching that itch for something new….! Not only will you be swapping fabric, but you will be passing along potential. Sharing a possibility of what that fabric could become with someone who will see it with fresh eyes. Spreading the abundance, fulfilling that human desire, while connecting with other Makers, and acknowledging that we are all wrestling with the same issues. I have felt pretty disappointed in many of the directions American politics and commerce have taken in the past year(s). I know I am not the only one. The huge outpouring of opinion on #slowfashionoctober shows how much many of us take these ideas seriously. I like to think of this swap as a small act to reclaim our conscience. • Fill out this form to register for the swap. Registration will close on November 1st. REGISTRATION IS NOW CLOSED. I AM THRILLED ABOUT ALL THE FOLKS WHO ARE SWAPPING....! I will keep all your contact information secure. • The swap is open to all, regardless of where your sewing machine lives. If you don't want to ship overseas from where you live, you can alert me in the form. But really, the cost of shipping is still minimal compared to the cost of the actual fabric.... If we have a number of participants from the same region I will try and pair them up so shipping is easier. • I will send you your swap recipient’s name and address by November 6th. Someone will get your name too! You will be sending fabric to someone other than the person who is sending to you. Mixing it up! • The fabric you swap should be no smaller than two and a half yards, but as large as you like. Your recipient needs to be able to make a garment with this piece of fabric. 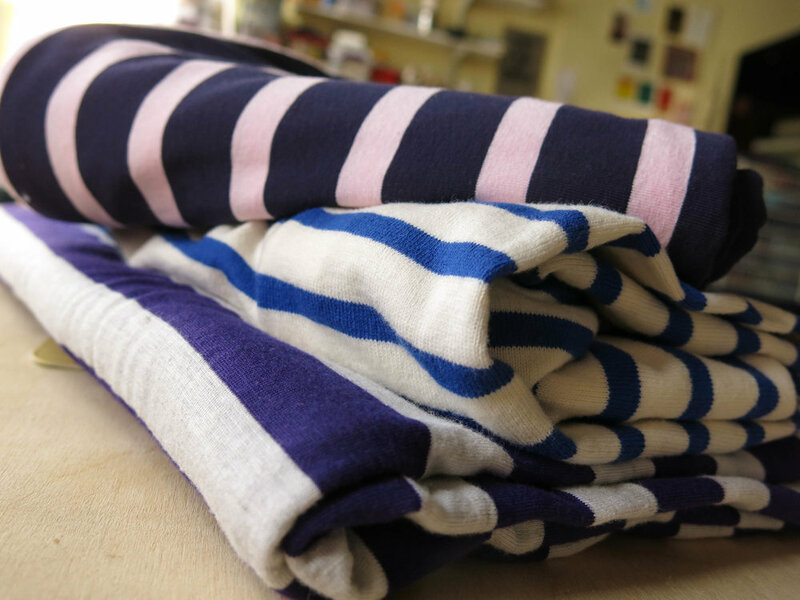 While we are all different sizes and need different amounts to make garments, 2 ½ yards is a safe place to start for all. But if that five-yard cut of forest green linen is never going on Your body, pass it along to another one…. • The fabric you swap should be suitable for garment sewing. No flat or quilting cottons please. I know there are some flat cottons that can be made into skirts, some that have more drape, but I’m going to draw the line on this one. This is a garment fabric swap, and I want everyone involved to be able to make a garment from the fabric they receive. • Please postmark your fabric on November 13th. Email me your shipping confirmation when you mail your fabric. I’m not going to play sheriff, but we don’t want anyone to get stiffed…. • Tell your stash recipient who you are and what your Instagram handle is so they can thank you for the new fabric! Feel free to include a small gift- candy, notions, thread, buttons, cards- if you would like to share with your swap. This is certainly not required, but I have seen others do it in swaps. • Use the hashtag #slowfashionfabricswap on social media when you get your fabric. Tell us what you think you will make with the fabric. Share your thoughts about consumption, about new fabric, about old fabric, about anything the fabric inspires in you! Got any ideas, observations, questions I can address...? I'm putting this out there with some time for us to all think about it before you have to do anything concrete. But, I don't know, I think it's a pretty cool idea. Who's in....?